Hospitals are not only complex buildings, but the building codes and requirements that guide their design can become so complex that they sometimes contradict themselves. An example of this recently occurred on one of our projects in New York City where city and state building codes had opposing requirements for the fire suppression system within elevator machine rooms and may have ended up setting a precedent between jurisdictions. The project was the renovation of the former North General Hospital in Harlem into the Henry J. Carter Specialty Hospital & Nursing Facility, a 201-bed Long Term Acute Care Hospital / 164-bed Skilled Nursing Facility, owned by NYC HHC. In this project, one particular element, the existing elevator machine room (EMR) was in compliance with the New York City Building Code, but not the State Building Code. Under the current NYC Building Code, automatic sprinklers are not permitted in elevator machine rooms. Meanwhile, NY State Department of Health (DOH) requires Hospitals to comply with NFPA 13-1999, which is silent regarding elevator machine rooms and as such implies that elevator machine rooms be provided with a wet pipe sprinkler system. With directly conflicting requirements, our first step was to submit formal waiver requests to the City and State and suggest equivalencies to satisfy life safety intent. Kallen & Lemelson Consulting Engineers led this communication process. Neither entity would accept our waiver requests but acknowledged that they were interested in finding a solution to this particular conundrum. NYC Department of Buildings emphasized their prohibition on sprinklers in the EMR stating that elevators are used by the FDNY during firefighting so that it would be unacceptable to shut them down due to sprinkler system discharge. NY State DOH denied an equivalency request by using smoke and heat detection at each motor and audio-visual alarms. DOH also cited CMS’ recent interpretations related to Long Term Care Facilities to reinforce their requirement to have fire suppression in the EMR. A solution wouldn’t be assured until we held a conference call with representatives from NYS DOH, and NYC DOB. It was agreed by both NYS DOH and NYC DOB that alternative fire suppression systems should be considered for the elevator machine room. With that agreement, the engineers moved quickly to consider available options for the EMR. Dry Chemical Systems, Wet Chemical Systems, Clean Agent Systems, CO2 Systems & Aerosols were at least briefly considered. 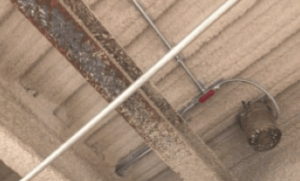 The first three options quickly proved to be inappropriate for use in an EMR with slab penetrations such as is normal for a traction elevator system. Further, in older traction elevator EMRs (such as was the case for this project), the shaft is vented through the EMR. In addition, CO2 systems created concerns for the life safety of the occupants in the EMR or hoistway. An aerosol system could meet all our goals. This system uses a potassium-based aerosol to extinguish the fire. This system is not addressed in current version of codes. The aerosol is inert and does not affect the equipment in the EMR and is non-toxic and will not harm people if they were be caught in the discharge. In addition, the aerosol is lighter than air so it would float within the EMR and not enter the hoistway. However this system had never been installed in NYC before and while NYFD knew of the system, they were hesitant to approve its installation. Our team met with FDNY staff in-person and confirmed that the system was a UL-approved system and was effective in extinguishing EMR fires. Then, working with the manufacturer, we compiled a list of reference contacts at other Authorities Having Jurisdiction (AHJs) where this system was installed. This process addressed their issues and we received approval to proceed with the design. The engineered system uses small canisters of aerosol located in the room with no piping or central storage tanks and is a condensed aerosol system per NFPA 2010. The system does not contain a reserve supply, but due to the modular nature of the canisters the FDNY accepted this solution. In the end, the communication and professionalism by all involved were the core skills required to work through these issues. And hopefully the precedent this project set was the ability to get the city and state on one conference call, and have a resolution all were amenable to.